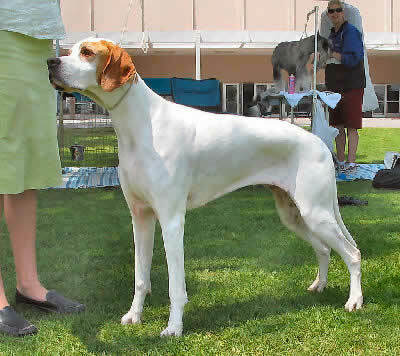 The English Pointer is excellent at locating game, to 'point' is an instinctual skill of the Pointer. The Pointer is a sophisticated breed, with quite a mix of dog breeds bearing strong characteristics in its background. It is believed to have a heiratage of Greyhound, Bloodhound, Foxhound and Bull Terrier. This type of mix in its makeup adds to its abilities as a prize hunting dog. The English Pointer was bred as a hunting dog but also makes a lively and friendly pet. These dogs are affectionate, intelligent, and loyal. They are also known for being very energetic. Dogs from show lines tend to do better as pets than those from field lines due to their more moderate energy levels. Breed Type A sporting breed, the Pointer is skilled at locating upland game. It may also find the prey once it is dead or wounded. Today, Pointers are occasionally bred with Labradors and Chesapeake Bay Retrievers. Description Pointers are muscular, with short coats. They may be white, liver, lemon, black, or orange, and they may be solid, patched, speckled, or tri-colored. Ears are mid-length and pendant-shaped. Eyes are hazel or chestnut, and the tail is long, straight and tapering. Males measure 22-24 inches tall; females, 21-24 inches tall. Weight should be between 44 and 66 pounds. Care and Feeding The Pointer's diet should include brown rice, avocado, poultry, and fish. Regular brushing and as-needed bathing will keep your Pointer's coat looking beautiful. It is important to check the feet and ears regularly. The Pointer is an average shedder. Regular vacuuming is important if kept indoors. Housing Your Dog Pointers should have ample living space. They are fairly active when kept indoors, and they should have access to a large yard. Social Behaviors Pointers are friendly with humans, including children and strangers. They may be timid if not socialized properly. They are usually well behaved with other pets, including dogs. Handling and Training Pointers are sometimes difficult to train due to their tendency to be easily distracted. They may also be slow to housebreak. Pointing is instinctual to them, so they are fairly easy to train for hunting purposes. Activities Pointers need lots and lots of exercise, including a daily walk or jog. They also love to swim, and should have regular opportunities to play off-leash. Breeding/Reproduction When selecting a mate for your Pointer, check bloodlines for hip dysplasia, epilepsy, and eye problems. Common Health Problems Overall, the Pointer is a healthy breed. Potential problems include epilepsy, eye problems, and joint disorders. Allergies are also somewhat common. Availability Pointers are fairly hard to find in many areas. Breeders may be located online. Prices vary greatly.